Woke up to sunny blue skies and warm temps…..perfect Greek weather. We headed down to the square to check on how things really are, not what the media is telling us. 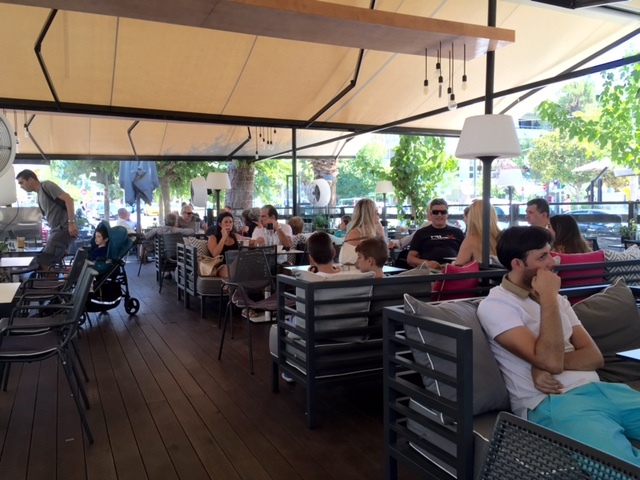 Although the shops were closed because it was Sunday, the cafes were bustling! Hit an ATM, no line. However, we did see many in lines later in the day…all organized, calm and peaceful. Since many Greeks are not traveling to the Islands this summer, the Athens beaches are packed! Speaking of packed, Plaka and Monastiraki were wall-to-wall people tonight, both Greeks and tourists. Was truly great to see but when you do overhear people’s conversations you can’t help but to notice they are focused on difficult times both now and in the future. That said, there does seem to be an underlying feeling of passion and perserverance. This is Greece.